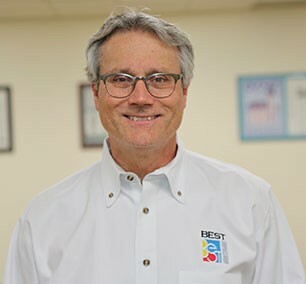 Today, Best Graphics Group comprises over 35 sales and service professionals throughout North America in support of any of your bindery, finishing, and packaging needs. Our 40 year history has seen us transform from a regional dealer to a national importer/distributor of the industries widest range of bindery, finishing and packaging equipment. In all we now represent 16 different lines of new equipment and as the direct importer for these lines we understand the process required to represent and support equipment nationwide. The success of our unprecedented 3-year warranty program with our 6-month product assurance program attests to our belief in the quality and trouble free operation of our equipment. New additions to our line up in 2017/2018 – Heiber + Schroeder Windowing and Tray Formers, IBIS Digital/Variable Page Stitching Systems, Ecosystem Film Laminators and Offline Blankers from Laserck – will continue to expand our reach with our existing product range of Osako Stitchers, Wohlenberg Perfect Binders, Itotec Paper Cutters, Young Shin Die Cutters, and Omega Folder Gluers, spanning the Print Finishing, Carton Packaging, and Corrugated Packaging Products market. Our new equipment lines lead us to used equipment opportunities…trade-ins, upgrades, and excess inventory. We market, deliver, warranty and support certified quality used equipment and our re-marketing capabilities extend to bank/finance off-lease or liquidation services, equipment logistics, equipment consignment services and outright equipment purchases. With over 12,000 direct email contacts in North America and over 400 domestic and international dealers, Best Graphics Group can provide the reach and professional assistance you need when either searching for or selling used equipment. To better support you, we have doubled our floor space providing permanent showroom facilities for our Itotec, Kudo and Osako lines as well as space for our partners; Wohlenberg, Ibis, Omega, Young Shin, and Ecosystem, and a better suited facility to clean, prep and repair – trade-ins or consigned equipment. Best Graphics Group represents the best – in finishing equipment. We’ve vetted these select proven, innovative manufacturers and can attest to their legacies of excellent quality, high value equipment that’s easily supportable and consistently manufactured. All of our represented manufactures have been continuously evolving their specific equipment for up to 100 years and our collective manufacturers share over 600 years of manufacturing excellence. We continue to be honored to represent our manufacturing partners and are proud to introduce, sell and professionally support them in North America. Give us a call; we invite you to be part of our group – The Best Graphics Group.